The ill fated attempt by the Allies to support Russia by supplying their beleaguered colleague through the ice-free ports in the Crimea, was the first engagement of the Australian and New Zealand troops raised for the first World War. This attempt to attack a well led enemy fanatically defending their own soil with the best available contemporary weapons and tactics resulted in a blood bath now regarded as the birth of the Australian and New Zealand nations. On 6 May 1915, the First Light Horse received orders to leave for the Gallipoli Peninsula (the western side of the straight linking the Mediterranean and Black seas, Turkey) without horses. Major HV Vernon to command. Australian and New Zealand infantry had already landed on 25 April. 25 Officers and 477 other ranks landed at 06:00 on 12 May, 2,000 metres south of Fisherman's Hut. One trooper was wounded in the landing. At 12:00 on 13 May, the unit took over front line trenches at Popes Hill. 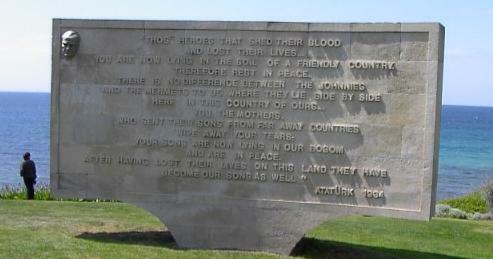 At 03:50 on 19 May, the Turks attacked to the cries of 'Jacko' and 'Allah' about 100 Turks reached the Australian trenches, those not killed outright were not seen to regain their trenches. 11 members of the Regiment were killed, 18 wounded. The Turks again attacked on 29 May, Lance Corporal Grimson being awarded the DCM for taking 11 prisoners from the front of his line. The regiment took its turn in the front line and reserve trenches until August. 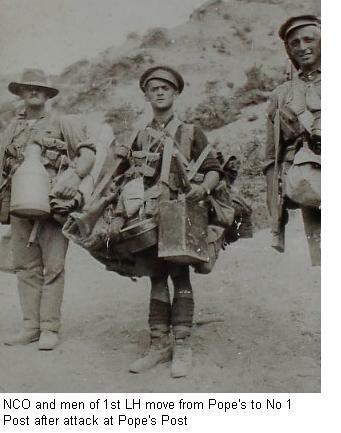 At 03:30 on 7 August the regiment was ordered to attack the enemy's 'Chessboard' trenches. 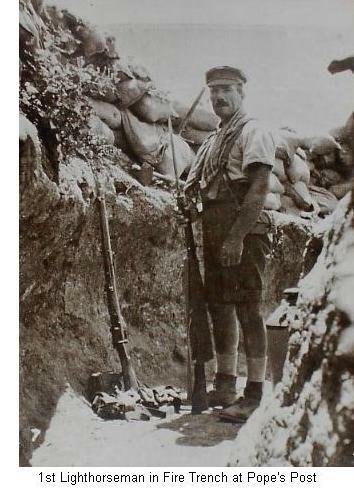 Major Reid who lost his life gallantly led the attack. The storming party reached the third line of trenches and held on for two hours, but the enemy attacked in great force and bombed the already thinned out regiment back. 15 were killed, 98 wounded, 34 missing (mostly killed), total 147 (the final count was 86 dead). All of the officers of B Squadron were casualties. The regiment continued a defensive role until 16 December when orders were received to withdraw. The effectiveness of the ANZAC withdrawal from the Gallipoli Peninsular was a stark contrast to the remainder of the campaign. There were only two Allied successes during the campaign, the battle of Lone Pine, and the Withdrawal. Both were well planned (Brundell White, an Australian staff officer planned the withdrawal) in contrast to almost all of the other battles where the generals thought it would be possible to muddle through. Lone Pine gained ground that stayed in Australian hands. The withdrawal saved lives. It could also be said that the enemy chose not to inflict casualties during this, usually the most dangerous of military manoeuvres. The Regiment embarked for Egypt on 23 December 1915. The person most responsible for the Turkish success at Gallipoli (he called it the "�anakkale Wars" after the Turkish town on the eastern side of the Dardanelles) was Mustafa Kemal. Kemal was a Lieutenant Colonel at the start of the campaign, he finished it as a corps commander, and national hero. After the war he was able to resist the forces seeking to wipe Turkey from the map, and became as Kemal Atat�rk the first president of the Turkish Republic. As president in 1934, he made the statement enshrined in stone on the memorial below. It is possibly the best expression of the feelings of the three nations, Australia, New Zealand and Turkey for whom this campaign means so much. 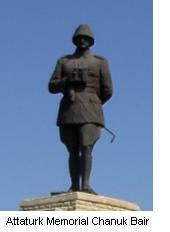 The Regiment was also awarded the honour Sari Bair for its actions during the Gallipoli campaign.